The North British Locomotive Company came into existence in 1903 as an amalgamation of three established Glasgow locomotive manufacturers: Dübs & Co., Sharp Stewart and Neilson Reid. Each of these companies enjoyed an excellent reputation for its products both at home and abroad. The amalgamation that formed NBL created the largest locomotive builder in the British Empire, building on the worldwide renown of its predecessors and exporting its products all over the world to places as diverse as Palestine, New Zealand, South Africa and Canada. Its locomotive output was as varied as its clients, with steam locomotives of every gauge, and ranging from tiny tank engines to massive Beyer-Garratts. Moving with the times, North British entered the market for diesel and electric traction after the Second World War and its lack of success in this field ultimately brought the company to its knees. 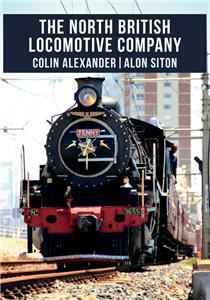 Here, Colin Alexander and Alon Siton present a lavishly illustrated exploration of one of Britain’s greatest locomotive companies, including the products of its three Victorian constituents and official works photographs, images of locos in service and some of the many preserved Dübs, Sharp Stewart, Neilson and North British locomotives on heritage railways and in museums around the world.